Sarkar is Vijay’s first full-on political entertainer where he takes on the political mafia. The first half moves at a leisurely pace while the second half is brisk with a surprise climax. Though there are quite a few unwanted scenes that drag the movie, Murugadoss has delivered a Diwali treat for Vijay’s fans. Sarkar directed by AR Murugadoss has been one of the most anticipated movies of Tamil cinema industry of late as Thalapathy Vijay has been aiming at a political entry and Sarkar is his first full-on political entertainer, bringing back the combo that delivered Thuppakki and Kaththi. Sarkar has released today on eve of Diwali, and here’s our exclusive Sarkar review. Sundar (Vijay), a corporate CEO returns to India to cast his election vote, only to be shocked to see his vote already been cast. He finds that Political Mafia lead by Radha Ravi and Pazha Karuppiah are behind this and gets elections canceled, and as the war begins, Sundar jumps to active politics. 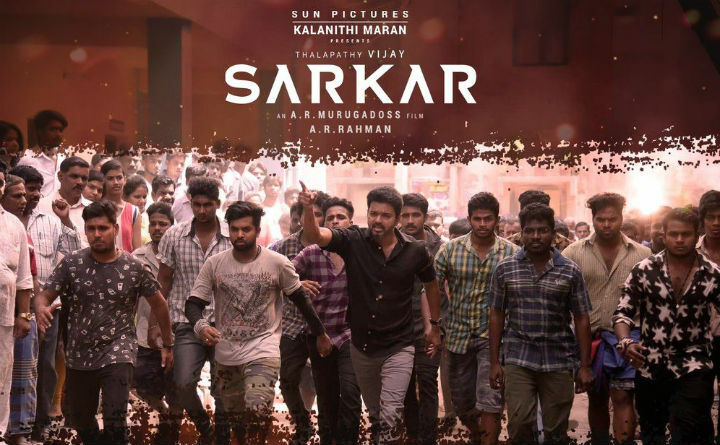 Who won the cat and mouse game between the corporate giant and power politics sharks and what decision Sundar ultimately takes is what Sarkar is all about. Vijay is his energetic self and plays his age as a corporate CEO to perfection, he dances with agility and impresses in mass action episodes and punches. Radharavi and Pazha Karuppiah are subtly menacing while Varalaxmi is over the top hamming, and Keerthy Suresh plays the typical eye candy without much significance. AR Rahman delivers a scintillating background score elevating mass sequences and of his songs, Simtangaran and OMG Ponnu are appealing. Cinematography by Girish Gangadharan captures the posh lifestyle of Sundar and how he gets to see a contradictory Indian life and the songs are a visual treat. Editing by Sreekar Prasad could have been better as there are several lags in second half. AR Murugadoss who had last delivered the disastrous bilingual spy thriller SPYder with superstar Mahesh Babu is back with a bang as he has delivered a stunning Political thriller this time with Sarkar. With an interesting plot of a man whose vote is misused fighting it out against the system, is novel and the whole concept of a corporate giant vs political mafia is uniquely presented. The first half moves at a leisurely pace, introducing the characters and gains momentum towards the interval block with the political plunge of Sundar, while the second half moves at a good pace, elevating the hero and his fight for justice and political fairness, ultimately ending with a surprise climax. Murugadoss could have avoided several unwanted episodes that drag the second half while he could have taken care of song placements. Overall, with a fine screenplay, good music and stunning visuals, Murugadoss has delivered a Diwali treat for Vijay fans with Vijay striking it big. Verdict: A decent Political thriller with Vijay in prime form, appealing to masses and his fans. Malayalam actress calls union a mafia!